with cheese pizza available as well. Description: Email amanda.pegram@yahoo.com' target='_blank'> amanda.pegram@yahoo.com for more information. 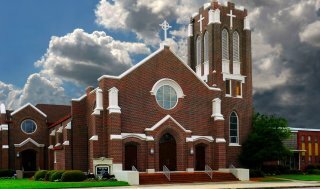 Description: All Sacred Heart Seniors and Parishioners are invited to our Parish Luncheon on Tuesday at 12:00 noon in the Parish Life Center. Enjoy the great food and fellowship! Call Joan Brady @ 601-310-2231 for reservations and or to-go orders. Email amanda.pegram@yahoo.com' target='_blank'> amanda.pegram@yahoo.com for more information. All Sacred Heart Seniors and Parishioners are invited to our Parish Luncheon on Tuesday at 12:00 noon in the Parish Life Center. Enjoy the great food and fellowship! Call Joan Brady @ 601-310-2231 for reservations and or to-go orders.